Gale Gand’s Pylloccine Ice Cream Sandwiches are the cutest things to come out of my kitchen in a long time– retro and adorbs! I had no idea what “phylloccine” meant, and went along pronouncing it incorrectly in my head all week, until about five minutes ago, when I finally read the recipe intro and found the explanation was right there all along. “Phylloccine” equals “phyllo fettuccine,” which just equals phyllo dough rolled up and cut into long strips. The strips get scrunched into sandwich-able rounds and buttered and sugared and baked. While the recipe calls for a mix of summer berries with this, I just had strawberries and simply diced them and tossed them with simple syup. It also calls for whipped cream, but I skipped it entirely…the ice cream was plenty, I think. Gotta trim calories where I can. These were really great and easy to make. I loved the crispy, sugary phyllo. Apart from baklava, I seem to forget how good phyllo is in sweet applications. Unlike a regular ice cream sandwich, these are too delicate and crumbly to pick up and eat with your hands (not to mention all those loose fruit bits), so definitely grab forks. For the recipe, see Baking with Julia by Dorie Greenspan (it’s also here). Don’t forget to check out the rest of the TWD Blogroll! This is just the best idea! 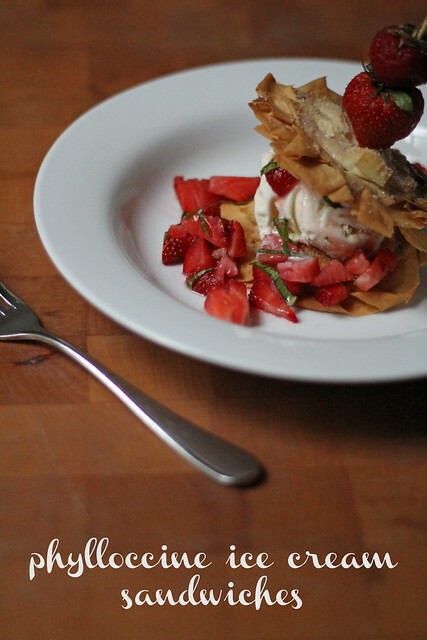 What a great way to enjoy summer berries & homemade ice cream….This I shall definitely make. Thanks. Love the crispy phyllo “biscuit!” How pretty and delicious. This looks like just my kind of dessert. I’m with you. The whole time I was thinking that “phylloccine” should rhyme with Phillistine. Beautifully done. They were cute, weren’t they? They look absolutely wonderful and from the sound of things they look easy to get together. Beautiful!! I love the look of the diced fruit – just perfect. I skipped the whipped cream as well – definitely does not need it.